It’s wonderful that spring is at last making an appearance, I love the extra light and longer days. However, it does mean a spotlight is shone on the interiors of our homes and it’s not always pretty. A serious spring clean is due in my house – I made baby steps yesterday by cleaning my first windows of the year! Seeing a layer of dust on the pendant lampshade, as I was standing on the windowsill. reminded me of an article I wrote a good few years ago on cleaning and caring for your lampshades. Ensure your shade is not too heavy or too large for your lamp base thus making it unstable and prone to damage. Ensure your table lamp is positioned so that it cannot easily be knocked over. Do not exceed the bulb wattage recommended by the shade manufacturer – a label should be attached. Avoid placing fabric or paper shades in direct sunlight as the colours will fade. Avoid denting hard shades (those lined in plastic), as the dent will often be impossible to remove. Remove any hanging pendant shades before moving or re-arranging large furniture to avoid damage. Do not allow your shade to become too dirty before you clean it – regular routine cleaning is more successful than remedial cleaning. For a hanging pendant shade, standard lamp shade, glass shade or wall light shade it will usually be easier to remove from its fitting. In all cases it is important to switch off all power to the lamp before removing or cleaning.Depending on the material your shade is made from there are various ways of cleaning it. 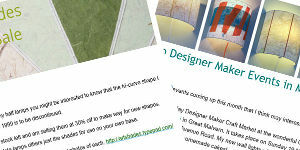 Here I cover the cleaning of paper lampshades, fabric lampshades and glass lampshades. Paper shades should be regularly dusted using a soft bristled brush (I use a large headed artists’ brush). Working in sections from the top to the bottom of the shade, use long sweeping movements to remove the dust, before rotating the shade and repeating. If the shade has any form of stitching or embellishment take care not to brush too vigorously to avoid snagging. Never use water to clean the outer surface of a paper shade. If your shade has been backed with a plastic liner use a soft cloth to wipe the inner surface – it can get very dirty. If your shade has a digitally printed image refer to the manufacturer’s instructions to avoid damage to its surface. 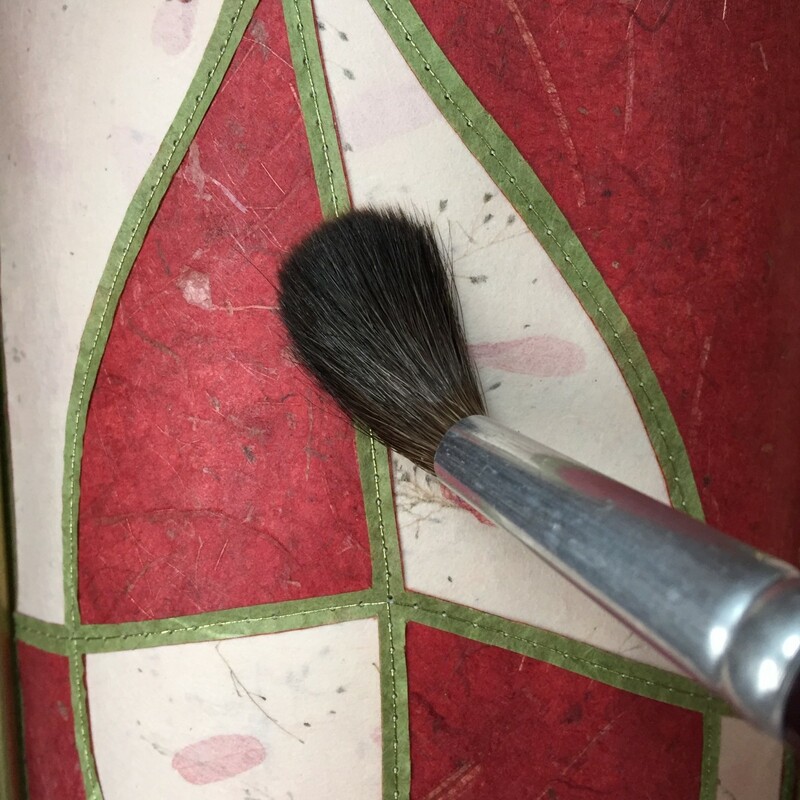 Most fabric shades should be regularly dusted using a soft bristled brush (I use a large headed artists’ brush). Working in sections from the top to the bottom of the shade, use long sweeping movements to remove the dust, before rotating the shade and repeating. If the shade is very large the soft brush attachment on a domestic vacuum cleaner may be used at its lowest suction setting. It is important to check that the bristles are clean and not too stiff so as not to mark the surface of the fabric – if in doubt attach a piece of fine gauze over the end of the hose and use that to gently lift off the dust. Care should be taken to avoid snagging any trimmings, fringing etc. If these are very dusty use a hairdryer on its cold setting to blow the dust away. Hard shades with a plastic liner will need their inner surface wiped with a soft cloth to remove the build up of grime. The lining fabric of soft tailored shades will benefit from dusting with the soft bristled brush used on the outer surface. Never use water to clean the fabric surface as it will leave ‘tide’ marks. Glass shades should be regularly dusted with a soft lint-free cloth. From time to time remove the shades from their fittings and using a damp soapy cloth carefully wipe over the surfaces of the shades – both inside and out. Care should be taken if there is any sort of pattern as excess water or rubbing may damage transfers or hand-painted surfaces. A wipe with a clean damp cloth will remove traces of soap and a final wipe with a soft dry cloth will leave it smear free. Wipe the dust from the light bulb and wire fittings before re-assembling. If you have any other useful lampshade cleaning tips do feel free to share them in the comments below.